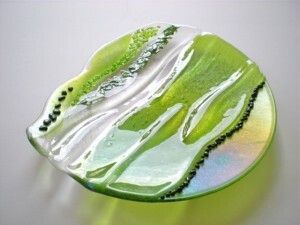 Kim Merriman creates wall art and functional glass pieces at her studio in Olympia, Washington. 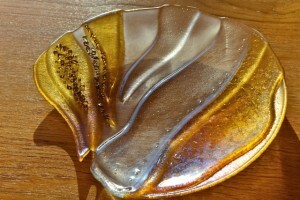 Merriman tells me that in addition to her metal and glass wall art, she has been branching out with functional art glass, making plates, platters, bowls, and small serving dishes. These are items she has made over the years, but mostly for gifts. She had never focused on selling these items in a retail market. Now, this aspect of Merriman’s business has been expanding. 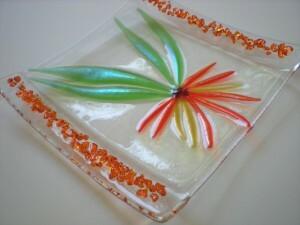 Merriman has also been commissioned by many people to make customized gifts for weddings, and other special occasions. “The third or last firing is the slumping, and done at the lowest temperature.” Merriman shows me the kiln open with the slumping molds inside. She explains that because of the temperature differences that occur in different parts of her small kiln she can only fire one shelf at a time. Otherwise there would be inconsistencies in the surface of her products. 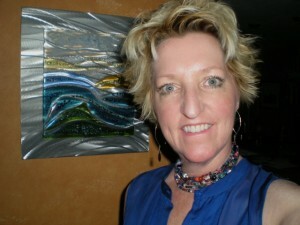 It is obvious that Merriman has spent a lot of time learning her art, perfecting her personal fusing style and designs. She shows me a piece of correspondence. I’d rather wait and save; your work is way too ‘wow’ to skimp on. I know I’d only regret it. I’ll keep you posted as to how things go, if everything works out this month then I’ll let you know asap, if it takes a little longer I’ll let you know also. I’m determined to make this happen, your pieces are totally amazing and are a concept I’ve been looking for a long time. The fusion of such vivid colour in glass on metal is perfection. There’s nothing equivalent that caught my attention that I’ve seen out there so I’m determined to do this right because they’ll be something that I’ll treasure. Merriman is known for her personal commitment to her clients and the warm rapport that develops through her attention to their requests. Her work has recently been shipped to clients in Miami, New York City, Ireland, North Carolina, and Chicago. 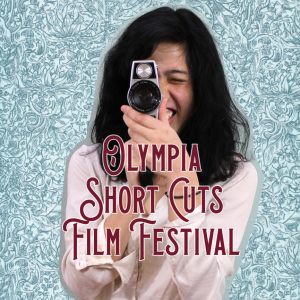 She was born and raised in the Pacific Northwest, and makes Olympia, Washington her home. 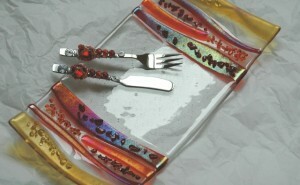 For the story of how she became interested in glass fusing, see the June 2012 ThurstonTalk article A Visit with Kim Merriman. Contact Merriman at Kim@KimMerrimanArt.com or visit her website. “My art expresses the gratitude I have for living in a place where I witness such beauty – land, sky, water and the scenes and wildlife from each. I don’t take a second for granted,” she summarizes.